The reviews are pouring in on David’s performances and this is just a small portion of what the critics are saying. Richmond Times – Dispatch- Sometimes, it’s not so bad to come in second. And it certainly doesn’t hurt if you’re a tiny teen idol with puppy dog eyes and hair begging to be ruffled. Lehigh Valley Music Blog – Teen “Idol” Archuleta hits all the right notes at Croc Rock – What’s not to like about “American Idol” runner-up David Archuleta? Absolutely nothing, if you were at Allentown’s Crocodile Rock on Sunday. In a concert that spanned 70 minutes and 14 full songs plus a medley of four songs, Archuleta sang with passion, exuded an engaging boyish stage presence and didn’t hit a single bad note with his rich tenor voice – and in fact, hit many very good ones. Boston Herald – David Archuleta may have settled for second place on the seventh season of “American Idol,” but he got a pretty good consolation prize: a career. Tuesday night’s sold out performance at Pearl Street in Northampton was any indication, Archuleta has the ingredients to not just excite fans in a dingy nightclub on his first solo tour but to play bigger venues in the near future. In sum, Archuleta may be the perfect pop concoction: looks, talent and charm, with a sound that appeals to teens and grandparents alike. “American Idol” may have put him on the map, but this young star casts a spell that’s all his own. Chicago Sun-Times – Archuleta in concert throws doubt on “Idol” votes – There is a pure, pleasant pop quality to Archuleta’s tenor voice and just enough raspy soul to add shape, color and weight to the tone. And he sure knows how to work a crowd. Fans at the all-ages, general admission show began lining up around 10 a.m. Sunday for the coveted spaces close to the stage. The “Idol” runner-up made it worth their while when he took the stage in jeans, a black shirt with the sleeves rolled up and an gray square tie to perform “Touch My Hand.” It was a calculated and obvious choice to begin the show, and Archuleta made darn sure he touched just about every hand thrust towards him from the first couple of rows of people. These are just a few snippets of many reviews of David’s outstanding performances and they are getting better and better as well as his command of the stage, interaction with his fans and of course his vocal ability to make any song his own. He has broken out of the American Idol shell and proved America got it wrong last season when the majority voted for the rocker over the crooner. I NEVER HAD A DOUBT!! I love reading these glowing reviews! Thanks for posting them. 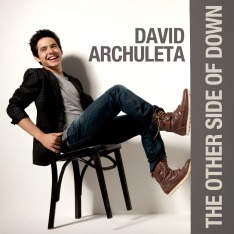 I will always believe that the majority of people voted for David Archuleta to win AI. It was a minority of Cook fans who were able to log thousands of votes using telephony software. Such mass voting is not fair and not a true indication of popularity. I’m with you on this, minja. Too bad American Idol is more interested in announcing the gazillions of votes that pour in — not to mention the dollars raised by the various voting techniques — then it is in honestly tallying the votes. If the show were to adopt the voting procedures used by Dancing With the Stars, then I’ve no doubt results would more accurately reflect the public’s preference. Speaking of Dancing With the Stars, it’s coming close to overtaking A.I. in ratings! Thanks for the reviews, pikepss. I agree that Touch My Hand is a “calculated and obvious choice”, a great ‘first’ song for David’s concerts. It’s powerful as the drumbeat sets the pace and he comes out on stage to an exuberant crowd. Throughout the concert his fans elevate, swoon and pinch themselves for reality checks. Then he ends the show ‘up close and personal’ to bring the audience back down to earth – in a blissful sort of way. It’s David’s way of sharing that he wants love to be in the hearts of all who hear his voice. Is it an obvious calculation or is it a spontaneous mirage? How to define David?